I'm sitting on the couch drinking a margarita. A margarita-ish, I should clarify: a slapdash approximation of the classic cocktail; a quick and dirty template you can stir together without worrying too much about ratios or jiggers or ounces. Thanks to a good friend with a keen sense for home bartending, I have the technique down pat. Squeeze one small lime and one medium orange into a glass over ice. (Strain it if you're fancy, but, I'm not.) Add a 2 second pour of triple sec and a 4 second pour of tequila. Bad day? 5 seconds of tequila. Really good, celebratory day? 6 seconds! Add a splash of seltzer. Stir. Drink. Repeat. Brightly colored scenes from an HBO sport special flicker in my peripheral vision on the television. The hour-long feature is a showcase of the Toronto Maple Leafs road to the hockey Winter Classic, and the Canadian accents are fierce. I'm ignoring it (sports, eh? ), and listening to a new favorite song (Night Bus by Gabrielle Aplin). Today was a glorious summer day: sunny with brilliantly blue skies shot through with pale wisps of clouds. Sitting directly in the sun, it was warm enough to require a slathering of SPF 30. I changed into a bikini and read my book for an hour in the waning late afternoon warmth. But there was an underlying crispness to the air, a whisper of book bags and crates of apples and new pencils. Fall is pressing at the edges of August, touching the last, long hot beach days with its cold fingers. There's nothing nicer than a new season, and the attendant excitement of ordinary, simple things writ large by the novelty of change. Sweaters and hot cider and the arrival of tiny candy bars in every corner pharmacy. I'll savor the last few hot days first, soaking up the sun on my skin at every possible moment. Tonight though, I feel quiet. Tired out from a week of travel (out to the tip of Long Island, a ferry ride across the Sound, a few days in the lush emerald hills of Vermont), and happy for my own bed, and my own grocery store, and the semblance of a routine on the horizon after the holiday weekend. I made a frittata that changed my mind about proper egg-cooking techniques. (I used to feel strongly that frittatas must be baked in the oven to be really and truly fluffy, but this recipe took a mere 5 minutes on the stovetop!) (Also breakfast for dinner is a YES YES YES.) The kitchen is warm. A baking sheet of brown butter toffee cookies is cooling nearby. I've made it a habit to keep a stash of frozen, portioned-out cookie dough balls in the freezer. This is a great move to start practicing: Whenever you notice you have no dessert, you can just turn the oven on and in less than 15 minutes (with no dishes dirtied! ), have warm cookies. Next time you make a batch of cookies, just reserve a couple balls of dough in a plastic bag in the freezer. Tonight's frittata is the perfect confluence of comfort food and nourishment, and wildly simple at that. If you follow the general method, you can sub in any vegetables or odds and ends you have in your refrigerator instead of the ones I used. Got a nub of cheddar cheese? Grate it and add it with the eggs. A lone red bell pepper? Dice it and toss it in with vegetables. Sturdy vegetables or ingredients (potatoes, onions, etc.) should cook first so they can soften and get brown and crisp. Then medium ones (broccoli, mushrooms, and so on), followed by delicate or quick-cooking vegetables and herbs (baby spinach, arugula, basil, and the like). Cook all the "add-ins" in this manner over medium-high heat in plenty of olive oil and a generous shower of salt and pepper. Once they're browned and delicious and fragrant, crack a few eggs into a bowl (here is where you add any sorts of cheeses or dried herbs and spices) and whisk them together quickly until frothy, then pour them over the vegetables in your pan. Turn the heat down to medium-low, cover the pan, and cook until the eggs are set. This will take about 5 minutes. 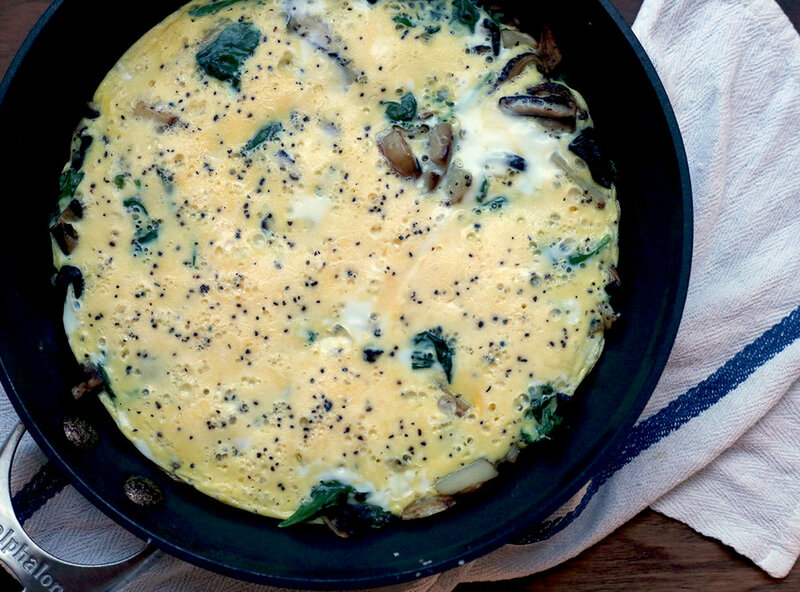 Flip the frittata out into a plate and devour it. Tonight, I cooked thin half-moons of potato until crisp and golden. I added silvers of shiitake mushrooms, and translucent slices of scallions. Once browned, I tossed in a few cups of baby spinach, stirring it all for a few minutes until wilted. I poured six eggs over the top, and let it all cook, covered, while I prepped my margarita. On the side, I tossed together bean sprouts with sesame oil, rice wine vinegar, black sesame seeds, some chopped kimchi, and a diced green apple. A little weird, flavor-wise, for a dinner combination but good. And homemade. I change into pajamas: the soft cotton ones with short sleeves and mother-of-pearl buttons running down the front. I brush my teeth, I think about you. I braid my hair. I climb under the covers, open my book to the right page, and tuck myself beneath the crisp sheets. Peel the potatoes, cut them into thin half-moons. Slice the white root ends of the scallions thinly and discard the green parts. In a medium frying pan over medium-high heat, heat 2 tablespoons of olive oil. Add the potatoes, season generously with salt and pepper, and cook, stirring occasionally, for about 10 minutes until the potatoes are golden brown. Add the mushrooms and scallions and cook for about 3 minutes. Add the baby spinach, season with more salt and pepper, and cook until wilted, about 2 minutes. While the spinach cooks, whisk the eggs together in a bowl with some salt and pepper. Using a spatula, press the cooked vegetables into an even layer in the pan. Pour the eggs over the top, reduce the heat to medium-low, and cover the pan. Cook for about 5 minutes (start checking after about 3 minutes) until the eggs are set. You can slice the frittata and serve straight from the pan or flip it onto a plate and serve that way.